As a design tool, rapid prototyping has proved invaluable to engineers wishing to visualise a part in 3D before setting about a full production run or deciding that further improvements can be made. From its beginnings in the mid-1980s, the process that includes selective laser sintering (SLS), stereolithography (SLA) and fused deposition modelling (FDM) has now been joined by additive manufacturing (AM). Normally used to manufacture parts with complex geometries, AM was employed in 2011 to create a part designed to significantly improve a woman’s quality of life. Aged 83, the unnamed Dutch woman became the world’s first recipient of a patient-specific lower jaw made from titanium using AM. She needed the fixture because progressive osteomyelitis — an acute inflammatory condition within bone, bone marrow and surrounding soft tissue — had developed as the result of a tumour. Carsten Engel, a biomedical engineer from Belgian technological research centre Sirris, consulted and advised Layerwise, the company that built the part using AM, and Xilloc for the regulatory aspects of the implant design. The project — developed by the Biomed research group of Hasselt University in collaboration with engineers from Xios Hogeschool, Leuven University and Xilloc Medical, plus maxillofacial surgeons from Orbis Medisch Centrum Sittard-Geleen — delivered a quick solution. Preliminary studies were required before the team could build what Engel describes as the symbiosis between anatomy and AM. 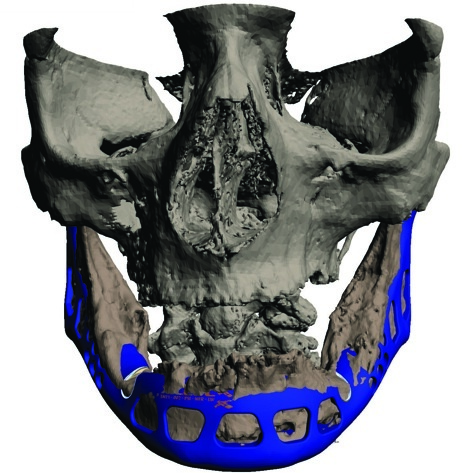 First, a version of the mandible and skull structure was created in polyamide in order to enable engineers to look at the problem and take decisions on the design of the future implant. Using software called mimics from materialise, the team built up a layer-by-layer representation of the patient’s anatomy from the CT scans. At this stage, they were able to use 3-matic software to create some of the roundings (the holes and spaces in the finished product) for the implant. 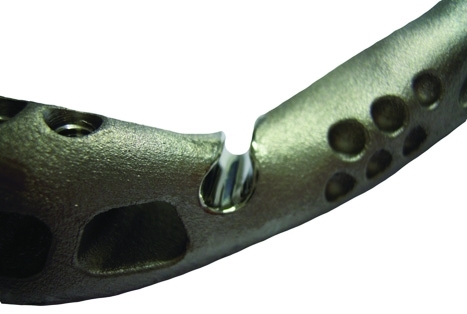 A prototype titanium mandible was then developed and modified according to advice from the surgeon. Titanium, used in medical applications since the 1960s, was chosen as the material with which to build the mandible thanks to its strength and because it is approved for Food and Drug Administration (FDA) applications and also to ISO standards. The team also wanted to coat the mandible with a bioceramic made by Cam Bioceramics that was compatible with the metal. Engel explained that the coating would help with biocompatibility following the operation, as well as helping with boning growth on the entire mandible. Layerwise has ISO certification for medical implant manufacture and Xilloc, which placed the implant on the market with CE marking, is similarly ISO accredited. Building the implant took between eight and eight-and-a-half hours. Engel believes there are a number of advantages to building a medical implant with AM over subtractive processes. 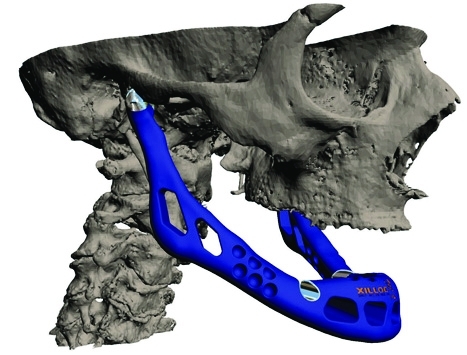 ‘I’m not sure you’d be able to construct this mandible with conventional milling or drilling technologies and achieve the same manufacturing price; you have lots of raw material and the time to make it would take two to three times longer,’ he said. Another financial advantage can be found in the operating theatre itself, as using the new method can reduce the operating time from 20 hours to four hours, bringing with it obvious cost reductions. Importantly, the real advantages lie with the patient as he or she is having a custom part made for his or her anatomy. ‘It is not possible to have a better fit,’ explained Engel, adding that anaesthesiology is much reduced (a factor to be considered with very young or elderly patients), recovery is likely to be quickened and the likelihood of infection is reduced too. The operation was a complete success, with the patient able to speak soon after. Engel said she has a check-up each week, noting that the surgeon is following her progress closely too. As an outpatient, she is checked for infections, boning growth and functionality. ‘You have nerves, you have vessels, tendons as well that are grafted to this mandible so it is very complex,’ he added. Engel believes it is only a matter of time before surgical AM becomes more enhanced and sophisticated. Barry Assheton, sales director at CRDM, concurs that rapid prototyping/additive layer manufacturing has the potential for further use in the medical sector. His company worked with engineer and Marfan syndrome sufferer Tal Golesworthy to develop EARS (External Aortic Root Support), which is estimated to have saved 25 to 30 lives. The finished part was made using nylon 12 and SLS. He said: ‘People are investing time and money into a wider range of materials and that is the key thing. In the medical sector, the restriction, as it always has been, is in availability of suitable AM materials for surgical applications: to have the right qualifications, traceability and all the facets that a medical application would require. ‘In the past, the materials that were on offer through ALM were really for training aids or for the development of a new product or to give the surgeon a feel for the [organ] part prior to an operation. Paragon is offering three materials through SLS for the creation of functional prototypes. Standard nylon is said to offer good functionality, strength and durability and enough flex to allow repeated operation of clipping features. Applications include housings and substrates for automotive development. Glass-filled nylon is a stiff material ideal for mechanical fixings and mounting brackets, chassis and substrates. Flexible black nylon has good stability and thermal properties while being flexible enough to give repeated operation of living hinges. Proto Labs has helped Asylum Models &amp; Effects to manufacture complex plastic ‘bricks’ for a TV advert. Asylum was approached by a company chosen to help Santander create the advert — which featured an F1 car made from bricks. The company used a computer program to design the car. It decided to use a steel ‘skeleton’ in the interior to lessen brick requirements, but it still needed 9,000 to be delivered within eight weeks. Proto Labs analysed the CAD models, generated a free online quote then used injection moulding to produce the bricks. Stratasys and Optomec have completed a joint development project to merge 3D printing and printed electronics to create the world’s first fully printed hybrid structure. The first project, the creation of a ‘smart wing’ for an unmanned aerial vehicle (UAV) model with functional electronics, has the potential to change product development in areas including medical devices, consumer electronics and aerospace. An Optomec aerosol jet system was used to print a conformal sensor, antenna and circuitry onto the wing of a UAV model. The wing was 3D printed with the Stratasys FDM process. Physik Instrumente (PI) now provides a three-axis nano-positioning stage that is used in a novel laser lithography system by Nanoscribe. The lithography system can produce fully automatic, repeatable, complex 3D structures. Submicron structures with sizes of up to 1mm and widths to 150nm are feasible. The driving force of the laser lithography system is a PImars P-563 flexure-guided, piezo-driven nano-positioning XYZ stage from PI. Technological developments, falling costs and new applications for 3D printing technology have driven the US rapid prototyping services industry in recent years. A report from IBISWorld shows that in the five years to 2012 revenue is expected to grow at an average annualised rate of 7.2 per cent to a total of $662.4m (£411m). Industry revenue decreased 10.7 per cent in 2009 due to recession-related declines in demand, but it bounced back in 2010 (11.6 per cent) and 2011 (18.3 per cent) as downstream markets recovered. Revenue is expected to grow 18.5 per cent from 2011 to 2012.